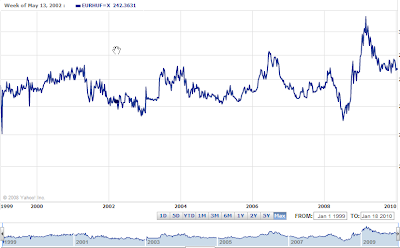 Global Economy Matters: Hungary Isn't Another Greece........Now Is It? "Structural reforms of the pension and social welfare systems, plus a rebalancing of the tax system, should allow the government to report a 3.9 per cent budget deficit in 2009, on a par with the preceding year and in line with IMF requirements". "Structural reforms", I asked myself, "exactly which structural reforms are we talking about here?" 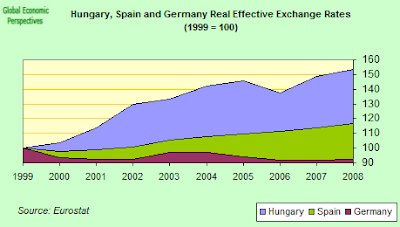 Certainly the EU Commission and the OECD have been pounding away at the Hungarian authorities on the pressing need for major changes in the health and pension systems (these areas - and the way they are rising as the population ages - are, after all, the underlying cause of the structural deficit in the Hungarian budget). In fact it seems to me that the FT is merely re-iterating here Peter Oszko's own claim that the government's austerity measures are working (and no matter how many times you repeat something, it doesn't make it true). As I have argued time and time (and time) again, major doubts remain about whether the recent "austerity" measures (whether we are talking about the post June 2006 package, or the 2009 one) have really done anything substantial to restore long term competitiveness to the Hungarian economy, since the only measures which could come near to being called "structural reforms" which have been implemented to date are the withdrawal of a 13th month pension payment together with cuts in the maternity leave system (and these are not really "reforms" at all, but deficit reducing measures). The rebalancing of the tax system the FT refers to is the shift from payroll and income to indirect taxes, which could make labour cheaper to employ, but since the reduction is countebalanced by an increase in consumption tax (which weakens domestic demand) to date the only visible consequence has been a sharp fall in retail sales, while we have seen little in the way of noticeable impact on either employment or on Hungarian exports. Indeed the situation is rather worse than the above chart suggests, since the anti crisis measures have lead to a sharp increase in public employment. while private sector employment has fallen quite sharply. Peter Ozsko has also been appearing in the press in recent days to inform us that Hungarian 2010 gross domestic product numbers could be positively revised when compared with an earlier government forecast for a 0.6 percent fall. His reasoning - as put to Reuters - is that "export markets will perform better so there is a better outlook for the country." In fact what he said was that he expected the country to return to quarter-on-quarter growth in either the second quarter or third quarter of next year - a possibility that is certainly not excluded. What he did not say - although some newspapers seem to have implied this - was that annual growth would be positive. "That does not mean growth, but at most a smaller contraction," the finance ministry told Reuters later, in order to clarify the reported comments. The correction to the earlier optimistic interpretation seems totally warranted, since the Organisation for Economic Co-operation and Development currently expect eurozone real final domestic demand to stagnate in 2010, with the Germany economy being forecast to grow by only 0.2 per cent, so it is hard to see the export market in the country that is Hungary's main customer giving that much-needed lift to Hungarian exports. But even beside this point, it is hard to see any forseeable increase in exports making up for the drop in domestic demand. In the first place Hungary has badly lost international competitiveness in recent years. And in the second both the Forint and consumer price inflation have been rising of late, only adding to these competitiveness problems. 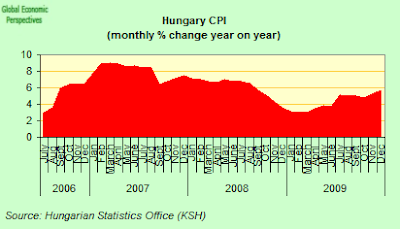 The best guess is that the Hungarian economy contracted by around 7% in 2009, yet despite this Hungarian consumer prices continued to rise, and are now up a whopping 72% on the 2000 level, yet the Forint has only fallen around 8% over the same period. Something seems badly out of line in Hungarian policy. As Mark Pittaway, Senior Lecturer in European Studies at the UK Open University points out, the difficult issue for Hungarian economic management has always been what to do about the external debt. The key is public debt, and the decision to which every Hungarian government has held to, not to ask for any re-scheduling and to insist on its precise repayment. This has forced the government to pursue consistently policies based on overly high interest rates to attract capital into the country - and this has been consistently the case since 1988-9. During the transition period this had two effects - to deny domestic businesses of credit, and to make it difficult for them to export given that the consequence was an overly strong Forint. In addition, the first post-1990 government was among the first to fully implement its bankruptcy law (earlier than Poland, and way earlier than either the Czech Republic and Slovenia) in 1991, in the depths of the first recession. The real economy was sacrificed on the altar of the financial stability of the state given the decisions made about public debt (remember the Czech debt was small, Slovenia de-facto defaulted on its share of the Yugoslav debt and eventually renegotiated it, and Poland gained partial forgiveness). 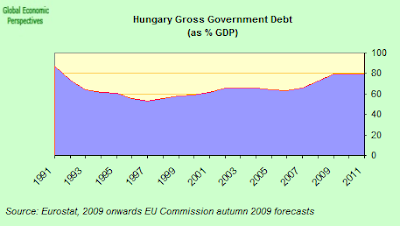 Hungarian gross government debt is now expected by the EU Commission to hit over 80% of GDP in 2011, but this is hardly the issue, since unless growth and competitiveness can be restored to the economy, the ageing and shrinking working age population problem will lead to what Moodys recently called (in the Greek and Portuguese cases) a slow death. And to the large government debt must now be added the indebtedness of households in Swiss Francs, which simply reinforces an "unrealistically" high forint policy, as Mark says, sacrificing the future of the real economy to the needs of maintaining financial stability. 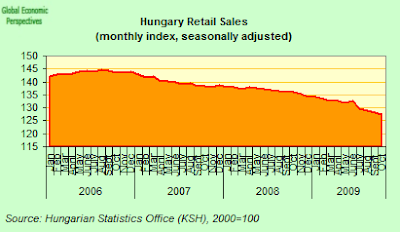 And during the term of the present government the situation has only worsened, since last week the Hungarian Central Statistical Office announced that the consumer price index rose 5.6% year-on-year in December (see chart above), up from the 5.2% growth in the previous month, and well above the average consumer price inflation for 2009 of 4.2%. And the culprit isn't hard to spot, since the government raised the VAT rate in June by 5%. The impact on retail sales was not that hard to imagine either - they were down an annual 7.5% in October, and by a seasonally adjusted 0.6% on September. And on top of all these issues, Hungary is shortly to have elections, a situation which is leading to all sorts of speculation about what might happen to the deficit. According to a recent research report from HSBC analyst Kubilay Ozturk, there is a clear risk that Hungary's budget deficit could deviate from the current fiscal path agreed with the International Monetary Fund (IMF), if - as seems likely - opposition party Fidesz assumes power later this year. While this year's budget deficit may well come in on target, economists close to the opposition party have been warning that the 2010 deficit could balloon again to 7% of GDP. The ins-and-outs of the argument are complex (since the figure is based on incorporating debt accumulated in state owned entities), but clearly the IMF would not be happy at such a development. But then Peter Ozsko argues Hungary may well no longer need the IMF money - which is only well and good, since the lending agency have specifically warned against declaring this level of deficit, and may be hard to convince if the deficit figure starts to head north again. Today, the IMF has warned Hungary again that it would not tolerate the country’s budget deficit swelled to 7.0% of GDP this year, a level envisaged by the opposition party Fidesz, the likely winner of this year's general elections. The government targets a budget shortfall of 3.8% of GDP, under its IMF-European Union credit line. In an interview with Dow Jones, IMF Hungary representative Iryna Ivaschenko noted that "the definitions [of government debt]are not always comparable, so you should not compare the 3.8% [of GDP] with the 7%. You cannot say they are not right, but it is comparing apples and oranges." "But if you do take, consistent with our definition, the deficit all the way to 7% [of GDP], such policies can clearly not be tolerated, because that would undermine fiscal sustainability and be detrimental for market confidence," Ivaschenko added. But what if Fidesz simply didn't want to accept the unpopularity for a policy which may not be working, and a further fiscal squeeze? The political logic of coming straight out with a "they have overspent" type of argument could be compelling, although it should be remembered what just happened to the last government who did this (in Greece), or what happened in Hungary in June 2006, after the then Prime Minister Ferenc Gyurcsany's "lies morning noon and night" speech. "I know that this is easy for me to say. I know. Do not keep bringing it up against me. But this is the only reason it is worth doing it. I almost perished because I had to pretend for 18 months that we were governing. Instead, we lied morning, noon and night. I do not want to carry on with this". That time the country had to admit to a fiscal deficit which was way beyond what they had been talking about previously, and the country then enetered a financial crisis which has now lasted three and a half years. Of course, this time nothing so dramatic will have been happening (there has been an IMF programme in place), but this does not mean problems may not arise, since financial markets are, after all, extremely nervous. And certainly analysts are anticipating upward movement in the 2010 deficit level. 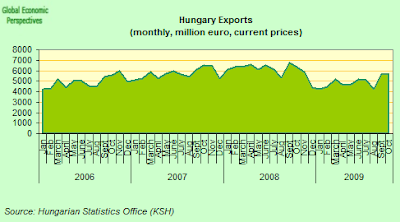 As Portfolio Hungary notes: "The market is now more convinced than a month ago that Hungary will not meet its budget deficit target in 2010, the consensus estimate of analysts showed in a Reuters poll on Thursday. 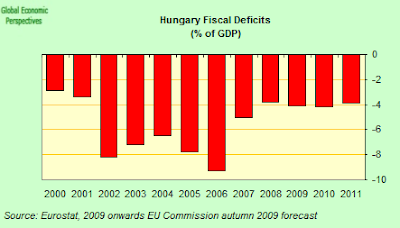 The median forecast for Hungary’s 2010 budget deficit came to 4.4% of GDP, up from 4.1% a month ago". "We don’t need IMF money any more and my expectation is that since Hungary is targeting the same track for the future, we won’t need financial help." So if Hungary does, as seems quite possible, decide not to take up more loans from the IMF, where exactly does that leave the country? Who will have the leverage to ensure the structural reforms which evidently are still needed. Evidently Greece can give us some indication, since while at the present time it is not totally clear whether or not the Mediterranean country will finally have to go the IMF itself, Europe's institutional structure is changing rapidly as a result of the challenge which Greek statistics and debt have presented for all the other EU countries. Only this week Europe's Finance Ministers warned Greece that it had to step up its efforts to tackle a fiscal crisis that threatens to spread to other countries across the region. Indeed the bulk of the discussion an the finance ministers meeting was occupied up with their concerns over Greece, since despite being in the eurozone, the country's credit ratings have plunged following the revelation that its government deficit estimates for 2009 were grossly understated. Greece has now presented the commission with a new plan aimed at cutting its deficit from the currently estimated 12.7 per cent of gross domestic product to below the EU's threshold of 3 per cent of GDP by the end of 2012. As a result of that report, the commission will propose an action plan in February and will 'lay down certain dates from June onwards in order to launch a discussion at least three times during the rest of the year on how the programme and reforms are going to be implemented,' according to Commissioner Almunia. That is, progress in deficit correction procedures will now be carefully monitored. As many observers have commented, this is the closest the EU has so far come to putting its hand directly on the economic policy of a eurozone member. 'The Greek programme concerns Greece firstly, but also concerns all the eurozone,' Luxembourg Finance Minister Jean Claude Juncker said on leaving the meeting. The Credit Rating agency Moody's Investors Service maintained its negative outlook on Greece following the announcement of country's stability and growth program saying that while the Greek government's plan to restore its fiscal credibility, reform its tax system and combat tax evasion is relatively well designed, at least for the short term, uncertainty remains about the Greek government's ability to implement the program. That is to say, it is action not words which now matter in the financial markets, and both Greek and Hungarian governments would do well to remember this. The next step is for the EU Council to set a deadline for when the Greek government must achieve its goals. This deadline is likely to be 2012, simply because the Greek government itself has set this target. All the relevant recommendations will finally be endorsed by euro zone finance ministers at their next meeting on Feb. 15-16 when they formally give notice to Greece to reduce the deficit, marking the last stage of the procedure before sanctions of various kinds that are provided for under the EU Stability and Growth Pact. Greece will then have four months, so until June, to act on the recommendations for policy action endorsed by the ministers. If it acts in a way which the Commission consider to be consistent with the undertakings given, the excessive deficit procedure will be then held in abeyance, until Greece reaches its target of a deficit below 3 percent. If, at the end of the three year period the Commission believes that the improvement is sustainable, it will ask the ministers to end the excessive deficit procedure. If on the other hand the Commission decides in June that Greece has not complied (unlikely), the Finance Ministers can then consider imposing sanctions. Since such measures should be imposed no later than 16 months after the decision that Greece had an excessive deficit, which was taken on April 27, 2009, the time scale would imply August 2010. * a variable component equal to one tenth of the difference between the deficit as a percentage of GDP in the year in which the deficit was deemed to be excessive and the reference value of 3 percent of GDP. The deposit cannot, however, be higher than 0.5 percent of GDP per year. If Greece were to find itself at that stage, this is how much it would have to pay. - stopping the EU's cohesion funds to Greece. - stopping credit from the European Investment Bank. - asking Greece to issue additional information, as specified by the ministers, before issuing bonds and securities. If Greece continued to ignore the recommendations, ministers could in 2011 intensify the sanctions by requiring an additional deposit equal to one tenth of the difference between the deficit as a percentage of GDP in the preceding year and the reference value of 3 percent of GDP. If, after two years, the deficit still remains above 3 percent, the deposit is converted into a fine. If the deficit falls below 3 percent, the deposit is returned. The interest on the deposits lodged with the Commission and the yield from any fines is distributed among EU countries without an excessive deficit, in proportion to their share of the total gross national product of those eligible. Luxembourg Finance Minister Jean-Claude Juncker also announced that there was about to be an overhaul of how the 16 nations using the euro coordinate their economies, with countries being be formally warned if they are running much higher inflation, average wage rises or current account deficits than their neighbors. Juncker said Finance Ministers are about to get involved into a range of far wider issues on how the economy is run, including government policies on structural reforms - such as making labour markets more flexible. From next month, countries will probably be warned by the European Commission if their countries differ too much from the rest of the euro zone on broad policy guidelines or on specific areas such as inflation, wages or current account deficit. That warning would not be backed by any penalty. "We need to broaden surveillance in the euro area," Juncker said, adding that closer monitoring should also extend to European countries whose currencies are linked to the euro and who hope to join the currency zone, such as Estonia and Latvia. So, Hungarian politicians be warned- You are not Greece right now, but you could so very easily end up where that poor, unfortunate country finds itself, and especially so if you make wildly optimistic growth scenarios, and debt to GDP forecasts, and doubly so if you think that coming out of the loving arms of the IMF will leave you free to go about your business as you see fit. The world around you is changing, and you need to get ready to adapt to those changes.